A podcast about all things Macintosh. For Mac geeks, by Mac geeks. Show 214. Apple Q1 numbers are in. Focus on iPhone sales and unlocked phones. iTunes more popular than RealPlayer, duh?! Pink iPod Nano. Fraggles and Farscape on iTunes. Quicktime 7.4 appears to break Premiere and After Effects. Microsoft Office 2008 Security issue and fix. UK pulls get a Mac Ads featuring Mitchell and Webb. O2 increases minutes and SMS for UK iPhone owners. Apple posts updates to Keynote, Pages, Numbers, and iWeb. Macbook Air shipping and Apple TV Take 2 delayed. Wireless issues take Air out of unboxing. iTunes 7.6 Firewall Permissions issue. What to know when buying external drives. What is RAID? A podcast about all things Macintosh. For Mac geeks, by Mac geeks. A special episode of the Maccast from Macworld 2008. We get a glimpse at Iris a new image editing application from the guys over at Nolobe. The app is currently available in public beta and joins a whole new series of Photoshop alternatives that have recently popped up on the Mac platform. A podcast about all things Macintosh. For Mac geeks, by Mac geeks. A special episode of the Maccast from Macworld 2008. We chat with G-Technology CEO Roger Mabon about their G-RAID mini and the G-Drive mini portable hard drive products. We also discuss G-Technologies recent acquisition by Fabrik and what it means for the companies future. 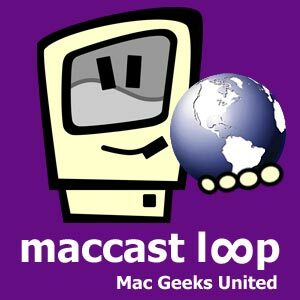 This is Episode 037 of the Maccast Loop. “The Loop”, offers a whole new way to join the Maccast community. It is recorded live each Sunday at 10:00 AM PST/1:00 PM EST. Using the Talkshoe network we offer live audience participation using text and audio chat. You can subscribe in iTunes or by using the links above and then join us live next week. Back from Macworld Victor and I set out to discuss some of the fall out at almost 2 weeks after the Stevenote. Luckily for us you jump in and the conversations take a turn for the better (what else is new, I know). We talk Apple TV, iTunes Movie rentals, how to get a new copy of Tiger, and whole lot more. A podcast about all things Macintosh. For Mac geeks, by Mac geeks. A special episode of the Maccast from Macworld 2008. Audio from the Mac Podcaster Meet-up 2008. Adam was joined by fellow podcasters Scott Bourne (Apple Phone Show), Leo Laporte (Mac Break Weekly), Dave Hamilton (Mac Geek Gab), Ken Ray (Mac OS Ken), Cali Lewis (Geek Brief TV), and Victor Cajiao (Typical Mac User) for a panel discussion on Podcasting. The group takled many of the topics and issues facing the podcasting industry today. The event also included a open mic session where fellow podcasters and listeners were able to ask questions and make comments on items raised by the panel. Special thanks to the event sponsors Podango and Data Robotics. A podcast about all things Macintosh. For Mac geeks, by Mac geeks. A special episode of the Maccast from Macworld 2008. We check out one of the coolest hardware products on the show floor at Macworld 2008, the Eye-Fi. An SD card that works with your digital camera and a web service to send your images directly to your computer on on-line sharing services over your wireless network. Amazing. A podcast about all things Macintosh. For Mac geeks, by Mac geeks. A special episode of the Maccast from Macworld 2008. Keep multiple iTunes libraries in sync with SuperSync. A podcast about all things Macintosh. For Mac geeks, by Mac geeks. A special episode of the Maccast from Macworld 2008. Mac GPS enabled software takes another step forward with Route Buddy version 2.0. We talk with the developer on the show floor at Macworld 2008 about this great new update to an already loved product.